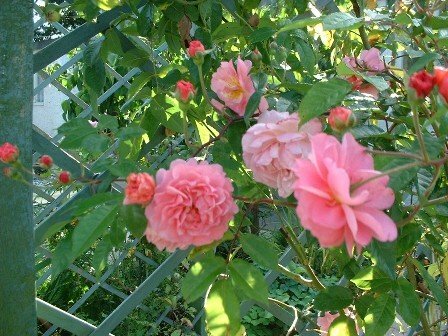 What is it about climbing roses that give us such a feeling of well-being; that make us calm, nostalgic, romantic and happy? Perhaps it is their perfect form or sensational fragrance. Whatever it is, these roses seem to 'do it' for many of us. They are a wonderful addition to many garden structures. Some are breathtaking in their beauty and fragrance and will give you pleasure each and every year. 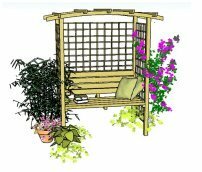 Whether you have a newly built, or existing, garden structure, such as a pergola, arbour, arch, garden wall, house wall or even a fence, climbing roses will add interest, height and beauty. 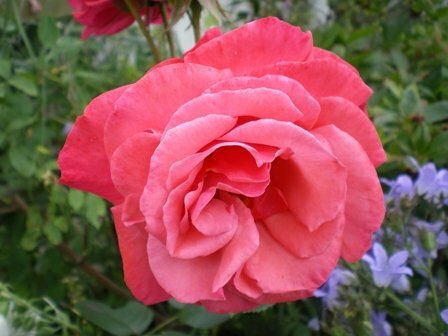 Have fun choosing and planting your climbing roses - they will reward you tenfold with a fantasic display! Group plants of different species, with contrasting or complimentary colours, together with your roses to give a truly stunning effect. My favourite roses are pinks of varying shades, white and purples. For instance, a pink rose with a purple clematis and white solanum. Or a white rose with a pink clematis and purple solanum. You may prefer a more bold approach - for instance a bright orange rose with a purple solanum in complimentary colours. This is a lovely vigorous pale pink rambler rose with the gorgeous velvety purple clematis 'The President'. Together they look stunning! Make sure that, if you choose particular climbing plants to group together, they actually do flower at the same time. Do a little research into both climbing roses and other climbing plants by checking out online retailers. Their websites are great for research purposes as they have a lot of information on size, planting and care. Crocus are particularly good for this as they stock a wide range of plants and provide a great deal of information with each plant. Follow the link below to get started. You can either link to 'Roses' or 'Climbers' from the 'Plants' section. This is a really good way to research plant information, as it shows suitability for different soil types, situation and plant features, with an excellent filter for these. It's possible to hone in on what you are looking for very quickly. This feature is extremely useful if you are a gardening newbie and wondering where to start. I also chose the this site for you to have a look at because it gives informative advice on roses for different aspect, colour, soil, size, etc. and also gives great ideas on planting, pruning, diseases and plant combinations. It has the added advantage of having on-line ordering, so you can decide on what you like and buy it all in one fell swoop. Alternatively, choose which plants you would like, research them, write a shopping list and take it to your local garden centre. If you would like more guidance on your choice of rose, go to 'My Rose Recommendations' below. There are, essentially, two types of climbing rose. We'll take a look at some of them here. 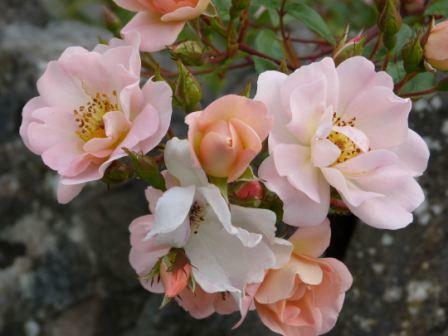 Firstly, there is the category usually termed as the 'Climbing Roses', which tend to be the larger flowering varieties found in many colours and forms. These roses can vary in height and rate of growth. Many are repeat flowering. Check on the eventual height to make sure the variety will grow tall enough for your needs. 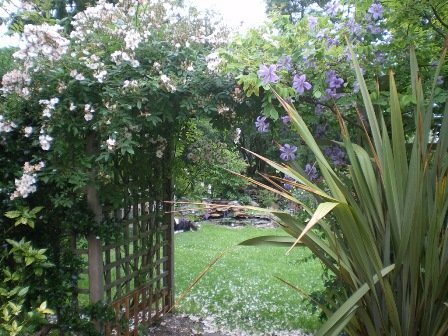 Then there are the 'Rambler Roses', which will usually cover a pergola or arch rapidly, clothing it in a mass of smaller flowers once a year, then covering it with colourful hips. Their impact comes from the fact that there are so many blooms at the same time. 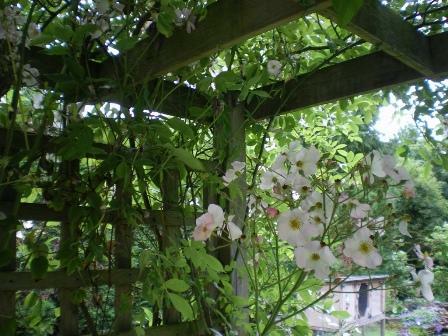 This is a pale pink-tinged rambling rose that absolutely covers one side of this pergola. And here is one of my absolute favourites 'Open Arms', which is classed as a short rambler, and can be trained up to 8ft. It flowers all through the season. 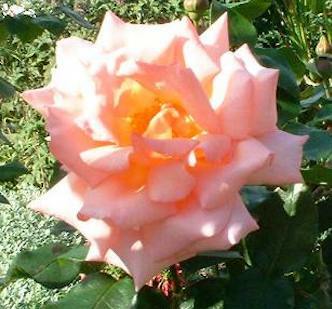 Below are the main two types of climbing rose for you to take a look at. Remember, some will only be available from suppliers at particular times of the year, generally around autumn time. These have larger flowers in the most stunning colours. 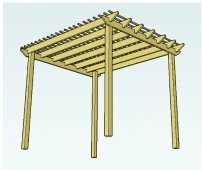 Rambler roses can clothe a pergola very quickly. There are some stunning pink roses available, many being heavily scented. Here are some of the best. 'Aloha' for its gorgeous form and fragrance. Just look at it here with the purple campanula. A gorgeous combination! 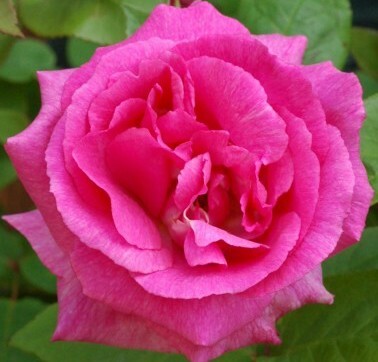 Galway Bay is the most gorgeous deep pink rose. However, it has only a very slight scent. 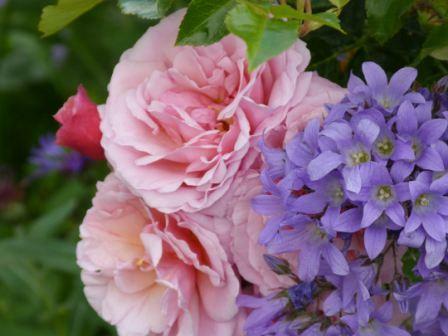 If you'd like a scented rose in a similar colour, go for Zepharin Drouhin. But if it's the rare deep pink colour you're after and the beautiful form, this is the one! 'Zepharin Drouhin' is a deep pink beauty with the most delicious fragrance and wonderful flowers. Keep it well fed, watered and sprayed to keep the plant healthy and flowering well. The big advantage is that it will grow happily over a north facing wall. 'Paul's Himalayan Musk' is a striking rambler rose with a fabulously heady scent. Being very vigorous, it will cover a pergola really quickly and will also climb up a tree! These rambler roses are sometimes hard to get hold of, as they are snapped up as soon as they arrive in the garden centre. 'Compassion' with its very fragrant, free-flowering, fully double, apricot-tinged blooms is a lovely fragrant rose with large heads and curled petals. 'Iceberg' is slightly fragrant with lovely blooms that seem to glow in the dusk. It sets off other climbers well being a very pure white. 'Rambling Rector' has a strong musk fragrance and a very vigorous habit with the flowers forming in large clusters. It will grow very well on a north facing wall. 'Gloire de Dijon' is an intensely fragrant, gorgeous, yellow, repeat-flowering climbing hybrid tea rose. Very pretty. 'Etoile de Hollande' has wonderful large, deep red, fragrant double blooms. 'Paul's Scarlet Climber' is slightly scented with a profusion of double scarlet flowers. 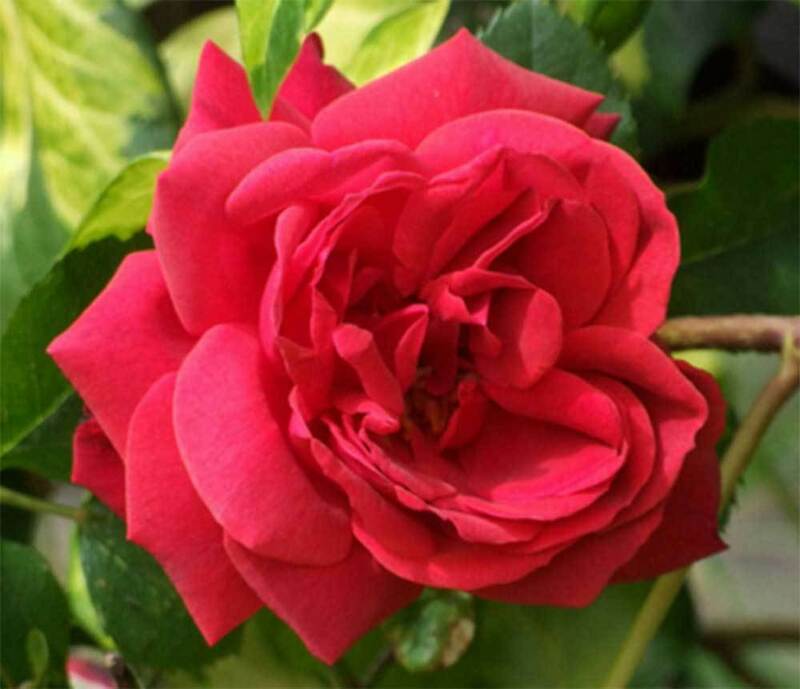 If you like red then this vigorous rambling rose will make a real splash! Bare-Root or Potted Climbing Roses? Potted roses are planted and rooted in pots. When taken out of the pot, the roots can be seen growing through the compost. Bare root roses are planted in the ground and sold without pot or compost. These roses are often much cheaper. Potted bare root roses are placed in pots for ease of handling in the nursery and distribution. When taken out of the pot, the compost will fall away, leaving the bare root. It doesn't really matter which type you buy, but try to plan your planting between October and December, if at all possible, avoiding frosty spells. The plants are at their healthiest at this time. 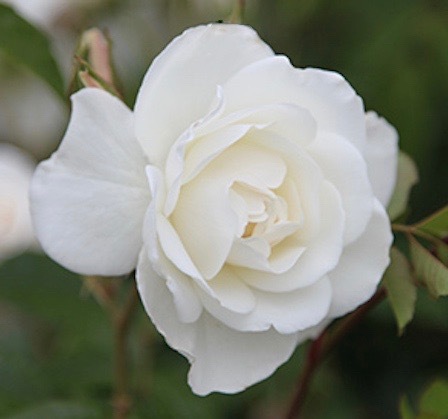 Bear root and potted bare-root roses may be unavailable during the summer months and only come into stock again in October. It may be that you just want to get on and plant your rose. If so, make sure your rose is really healthy when you buy it, and keep it well fed and watered, following the planting and care advice, below. Why would you grow roses from seed? 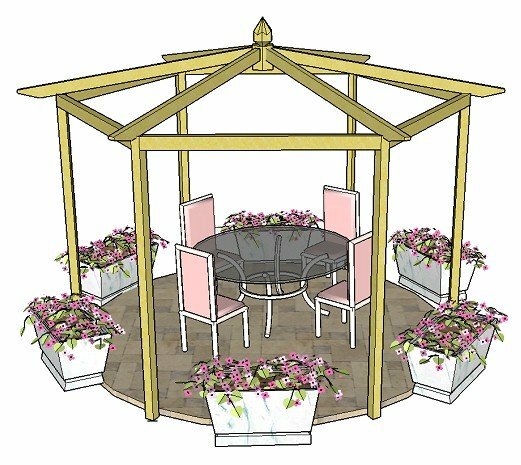 If you have a large area to cover, for example, a long walkway pergola (these are often planted with the same rose for maximum effect). You just like the challenge of growing from scratch. You are on a tight budget (roses can be expensive shrubs). You want another of the same rose you already have, but are finding it difficult to locate. Find out how to do this, step-by-step, here. 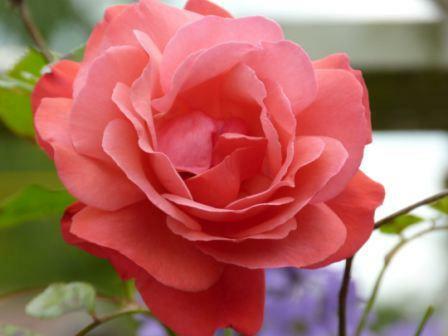 It is very unusual to see rose seeds sold online or in garden centres. Usually people buy and plant their roses in the autumn either potted or barefoot. Of course, you can always collect your own seeds for propagation, but only if you know which rose it is you want and you are able to find it. Only today I have come across these rose seeds being sold. This is the by far the best selection of rose seeds I've seen. They have a massive array of all different sizes and colours of climbing rose seeds to choose from! If you're keen to have a go yourself, it may be worth a look. 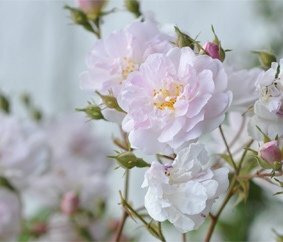 Choose a site that has a reasonable amount of sun each day, and where the roses are not competing with trees or hedges - the exception being rambler roses that do very well growing through trees. Soak the root ball for a good while before planting. Cut any long roots to about 10" and cut stems to about 6" from the base, leaving healthy, outward facing buds. Don't plant where another rose has grown. Dig a good size hole. Mix in some well-rotted manure(can be bought in bags from garden centres) and a general or rose fertilizer. Plant the stem base 3" below ground level to encourage shooting. Roses like a cool root run, and moisture. Mulch in the spring with well-rotted manure or compost and feed well. The healthier the plant, the more resistant to disease it will be. Pruning any plant can seem to be a bit of a daunting task, but it doesn't have to be! Listed below are two excellent sources of information. The first is a 'How to' article by Crocus on month-by-month pruning. The second is an excellent 'Pruning and Training' book by the Royal Horticultural Society, with very clear diagrams, instructions and pictures, covering all types of plants. It's a real gem of a book that will help both novices and more experienced gardeners. Take a look and hopefully you'll never look back. There it is in its full glory, looking magnificent and then - horror of horrors - your beautiful rose, which everyone has been admiring all week, has been attacked! Whether it's greenfly (aphids) or black spot, you know it is going to harm your prize specimen.